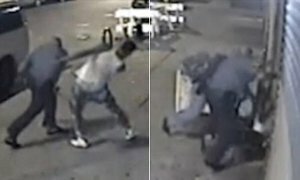 Two New York police officers have been charged for assault and police misconduct after they were caught on tape beating Kahreem Tribble, a 16 year old teenager with their fists and a gun (see video below). David Afanador and Tyrane Isaac were caught on a video chasing and catching the teenager on a Crown Heights street. After the boy surrendered, one of the cops is seen throwing a punch at the boy’s face before his colleague joined in, whipping his head with a drawn pistol. Brooklyn DA Kenneth Thompson said the video was troubling and “if any police officer has crossed the line – we have to hold him accountable”. Afanador was charged with felony assault and misdemeanor counts of criminal possession of a weapon and official misconduct. He faces up to seven years in prison. Isaac was slapped with assault and official misconduct, both misdemeanors. They were released without bail and are due back in court on Dec. 8. Read more in the NY Daily News.